This is a non-profit soliciting support for free charging stations at popular destinations like parks or museums. Sponsors pay for installation, maintenance and electricity ensuring the host site pays nothing. EV drivers also pay nothing to use these stations, however there is now a donation option for monthly payments to support the network. The company has a very long history in the electric vehicle industry. For example, the company was involved with designing the GM Impact concept car which was the precursor to the GM EV1. Today the company makes a full range of charging stations for all charging protocols, and their equipment is widely used. Aerovironment also operates a charging station network, primarily DC Fast Charging stations in the West Coast Electric Highway in Washington and Oregon. You can join as a member, paying a monthly subscription fee, or you can pay by the session by phoning into the customer support line. Autolib is both an electric car sharing service, and an electric car charging network. The service has proven popular, and Bolloré recently announced it would expand across France. The Blink Network was bought out by the CarCharging Group in late 2013 after ECOTality went out of business. This charging network has a reputation for flakiness, but CCG appears to be working to rectify the issues. All Blink stations are owned by the CarCharging Group. The fee for usage depends on whether local State laws allows CCG to charge by kiloWatt-hour or by the minute. Blink stations are installed across the U.S. with the largest concentrations in California, Arizona, Oregon, Texas, Tennessee and Washington. BMW see&apos;s its future as providing mobility services, one of which is to sell cars. Electric car charging is one of those services. In 2012, BMW Ventures invested in ChargePoint and of course ChargeNow is built on top of the ChargePoint network. The ChargePoint network (formerly Coulomb Technologies) operates charging stations across the USA and in Europe. The company doesn&apos;t directly own the charging stations, which instead are owned by the host sites. CP&apos;s role is to operate a management system with which host sites manages and configures their charging stations. The host sites set whatever fee or usage restrictions they desire. In many cases, CP stations are free to use, while in other cases there is a fee. 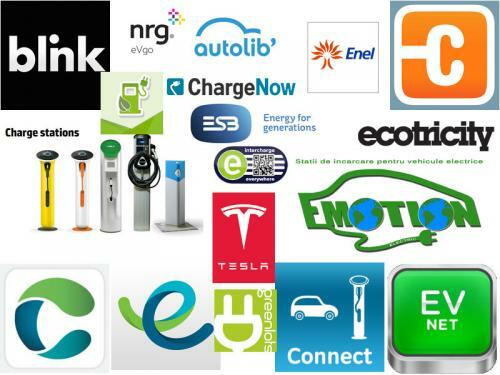 The UK&apos;s fastest growing charging network, it has over 2,000 charging stations across the country. Chargie is a peer-peer charging station sharing network. Folks who have a home charging station list their station on Chargie, and folks who need a charge look in Chargie. There&apos;s a modest fee to use another person&apos;s charging station. Think "Airbnb for charging stations". Charging station network jointly funded by the electric utilties of Denmark. A network of three-phase power outlets designated for electric car charging. It appears to be a cooperative effort by individuals to put stations into the network. Ecotricity is an electric company founded by a hippie that proudly embraces everything green, boasts of providing the greenest electricity in England, largely generated from big wind turbines. Oh, and solar panel systems they&apos;ll install on your roof. Of course they support electric cars with a charging station network. They have stations in England, Wales, Cornwall, Scotland, and at least one in Northern Ireland. This is the largest charging station network in Québec. It covers dozens of cities across Québec. There is a flat usage fee of $2.50 for a level 2 station, or $10/hr for DC Fast Charging. Estonia was the first to country establish a nation-wide network of fast charging stations. The infrastructure is entirely CHAdeMO units. Operated by the national electricity company, the CEZ Group, the company offers both home charging stations and public charging stations. Operates several charging stations around Romania. Has a line of charging stations available for sale. Makes solar powered charging stations for both electric cars and electric bicycles. Operates a few stations in Northern Italy. Subsidiary of Enel, a large multi-national energy company. Endesa is also an Enel subsidiary, operating in Spain and Portugal. They operate an electric vehicle charging network in Spain. Electric car charging network for Ireland. eVgo is a subsidiary of NRG, one of the USA&apos;s largest electricity generation and retail electricity companies. The eVgo operation is part of NRG&apos;s significant clean energy efforts in solar power, and more. The network is expanding market-by-market across the country. Their signature concept is the Freedom Station, which is an installation of two DC Fast Charging stations and one Level 2 station. These are typically installed in shopping center parking lots or other public destinations. Also offered are home or work charging stations. Several membership levels are available with details differing from market to market. Charging network for the Netherlands focusing on fast charging. Each station is located along highways, and are covered by a solar panel canopy. GE makes a range of charging station hardware, including the Wattstation. Be careful about the stations shown in their map, because some are marked Private while others aren&apos;t.
To use the stations first register with the service, then download the app into your smart phone. Charging sessions are initiated by scanning a QR Code on the station. Payments are handled through your Paypal account information. This is technically not a charging network, because what Greenlots does is operate open, standards-based, infrastructure for managing charging stations. Charging station owners can register their equipment with Greenlots, and configure options like usage fees and access methods. You can get a Greenlots card, or you can use the smart phone app to initiate charging sessions. This is a collaboration between several charging networks in Europe to provide roaming between the networks. A charging network being developed in Germany. The intent is to make comprehensive coverage of that country. Austria&apos;s electricity company offers some nice functions like solar panels for the home, and electric car charging. A system of over 1,300 level 2 stations, and over 50 fast charging stations, across Portugal. The website describes those numbers as a pilot project, meaning their plans may be incomplete. Electric cars are extremely popular in the Netherlands, and a data point to prove this is that The New Motion has over 10,000 charging stations in an extremely small country. A non-profit Non-Governmental Organization in Romania promoting clean energy technologies and electric vehicles. Subsidiary of the electricity utility, RWE. SemaConnect operates a network of level 2 charging stations in the USA, called SemaCharge. Their network is growing rapidly on the East Coast, and is perhaps the 3rd largest in the USA. You can sign up for a membership with SemaCharge via their website. However the easiest way to use their network is the Pay With PlugShare feature in the PlugShare application. This company originated to support "idle reduction" for long haul truckers. The idea is that, while trucks are parked, to plug into a power outlet to power refrigeration units or the in-truck sleeper unit rather than leave the engine idling. At many truck stops across the US, Shorepower has pilons with power outlets for this use. While the company is focused on long haul truckers, an EV driver can easily use these with a portable EVSE to charge their car. The company appears to be considering rolling out charging stations, but the website doesn&apos;t currently show any. That means the electric car driver must carry their own portable EVSE. See http://polni.si/ and http://www.elektro-crpalke.si/ for maps of all charging stations. This company started in Canada using a model where individuals or businesses sponsor charging stations. They&apos;ve quickly grown to have hundreds of stations across Canada, and the USA. There appears to be two Sun Country stations in Norway, and a couple more in Iceland. They specialize in higher power charging stations, such as 72 amps or 80 amps models from Clipper Creek. Tesla Motors designed the Model S (and Model X) to support charging rates up to 120+ kiloWatts. That&apos;s the advantage of a proprietary charging connector, is the ability to implement a custom solution that blows everyone else out of the water. The system is free for Model S and Model X owners to use, and will do a complete recharge of these cars in about an hour. Everyone else is free to be green with jealousy. If you have one of these cars, the station location data is on the dashboard. This charging operator has an interesting selling point - mobile electricity meters so that the EV driver selects their own electricity provider. Ubitricity charging points are simple electrical sockets rather than the high cost charging stations other providers use. This network began in Hawaii, and is expanding across the USA. Their model is to offer free charging stations to host sites, and free charging to their customers. The network is paid for with advertising posted on the charging stations. As part of the model, the stations are installed in high traffic high visibility locations, if only to make the advertising more valuable. This company sells charging stations, and offers various services related to electric vehicles, one of which is Zero-Net, an electric car charging network. Their network covers Great Britain, Wales, Cornwall and Scotland, with one additional station in North Ireland.